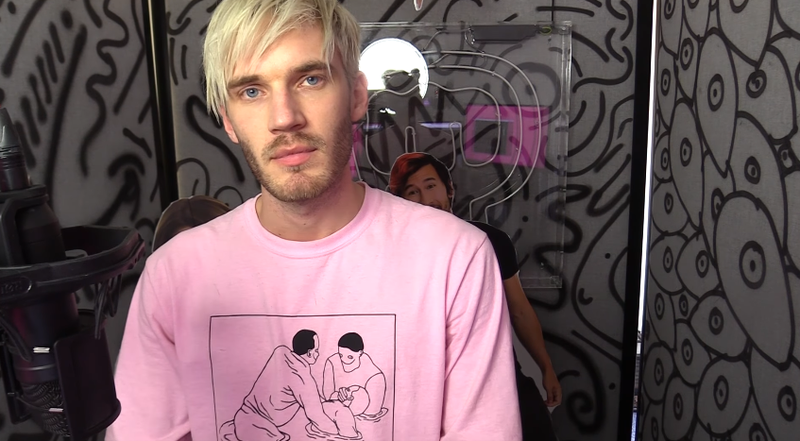 It’s been a little over a month since the blow-up surrounding Felix ‘Pewdiepie’ Kjellberg, and the Wall Street Journal report leading to the cancellation of his premium show. Since then, a lot has happened to the YouTuber and to at least one of the reporters who worked on that story. For Pewdiepie, it’s been a month of roiling emotions, including anger, intentionally taboo jokes and an intensified critique of the press, some of which he now tells Kotaku that he could have handled differently. For one of the reporters involved in the piece, it’s been a month of Twitter backlash from furious Pewdiepie fans, but that reaction has been met mostly with silence by him and the outlet that employs him. To quickly recap: the original WSJ article reported that Disney was severing ties with the YouTube star after the paper presented it with several examples of Pewdiepie making jokes about Jews or Nazis, including a video in which he paid freelancers to hold up a sign that read “Death To All Jews.” While Pewdiepie said some of the references had been taken out of context, he also apologized for jokes he that he admitted went too far. A day later, YouTube cancelled the second season of the Scare Pewdiepie premium show. The Journal article had three bylines, but since it ran, the person who has suffered the brunt of harassment on social media has been business entertainment reporter Ben Fritz. Fritz had the third byline, usually an indicator of having been least involved with a piece. For weeks now, Fritz’s Twitter mentions have been a mess of people demanding that he get fired, blaming him for damage done to Pewdiepie. Rolfe Winkler and Jack Nicas, the first two bylines, have gotten slight pushback on social media, but not nearly as much. On YouTube, Fritz has become the face of the newspaper thanks to a video where those freelancers from Kjellberg’s earlier video decided to hold up a new sign that read ‘Hypofritz.’ The portmanteau, which has now become a hashtag, spun out of old Fritz Tweets dug up by Kjellberg supporters. In the 2009 Tweet, Fritz is talking about a Chanukah party and remarks that he “had no idea Jews were so adept at frying.” That, combined with Fritz’s South Park avatar on Twitter, were enough to brand Fritz a hypocrite in the eyes of Pewdiepie’s fans—the thinking being, how could someone who seemingly appreciates crass humor “go after” a comedian like Pewdiepie? As the weeks went by, Kjellberg continued to pour gas on the fire. Rather than refraining from making Nazi references, he made some more, though with new context of skewering his critics. In game footage from last month, Kjellberg pretended to kill Hitler in jest, so that he could get a ‘free pass’ on his humor. The YouTube description for this video, which is currently the top featured footage on his channel, says the whole thing is “sponsored by WSJ.” In another video, he called a character a “secret Barbie Nazi” for lifting her arm, which Kjellberg has repeatedly suggested is a goof that alerts the Wall Street Journal to nefarious content. Earlier this month, Kjellberg uploaded a Conan Exiles video where he pretends to play as Hitler while also name-checking the Wall Street Journal. More recently, he pretended that a cardboard cutout of Danny Devito called Kjellberg a Nazi, in reference to the wider controversy. Some call-outs offer a visual gag where Ben Fritz, or the word ‘Hypofritz’ are pictured. These references have become sparser recently, but they still pop-up as in-jokes from time to time. Kjellberg’s audience has not abandoned him. More than a month since this all started, Kjellberg says that making these jokes were his way of dealing with a difficult time. All the same, posing the media as a boogieman makes for good video. On YouTube, some of the most common video formats involve rivalry. Sometimes, these clashes can be good-natured, and are played-up for pure entertainment: Kotaku alumnus Patrick Klepek had a series of videos where he played devilish Mario Maker levels created by Giant Bomb personality Dan Ryckert. Kjellberg himself has pretended to feud with a satirical YouTuber called ‘Dillon The Hacker,’ and more notably, the basis of Kjellberg’s canceled YouTube Red show was to present Jacksepticeye, another YouTuber, as the pseudo “villain.” (They are friends.) Judging by the views on Kjellberg’s videos, audiences appreciate rivalries, even when there are no stakes involved. On the other end of the spectrum, you’ve got actual quarrels and beefs unfolding between YouTubers, where emotions run high and feelings get hurt. Often, these spats are followed obsessively by “drama” channels, YouTube’s version of TMZ. Due to their volatile nature, the “benefit” of these fights is a toss-up for the actual people involved, even if millions of viewers eat it up like popcorn. The only thing the Wall Street Journal can be in this paradigm is the silent nemesis. In the past, Kjellberg has alleged that the media, Kotaku included, only pays attention to his gaffes rather than his good deeds, such as charity work. (Not true.) With the recent blitz of negative coverage, Kjellberg feels that many outlets are painting him as a Nazi sympathizer/enabler, a characterization that, in his mind, doesn’t ring true. As far as Kjellberg is concerned, the media is so eager to paint him as the bad guy, they can get basic facts about him wrong. When that happens, Kjellberg plays it off for laughs on Twitter and on YouTube for an audience that is ready to denounce traditional media as a whole. For a good while, Kjellberg had one of Fritz’s Tweets featured on his on Twitter.com page, but he recently took it down. Hopefully, it’s a sign that he, and maybe his fans, are ready to move on.